When one brother plays baseball, they all play want to play baseball. When one brother likes a certain video game, they all want to find out what that video game is all about. It's a brother phenomenon, or something like the force from Star Wars. My three boys are all individuals with their own interests and personalities, but they are also part of this brother phenomenon/force. It's so interesting to watch the little brothers imitating and wanting to be like the big brothers. My boys share a room, sports equipment and very busy lives. The little boys are always watching the older brothers. "With all of this comes great responsibility," I told my oldest son the other day, sounding sort of like Master Yoda from The Empire Strikes Back. The youngest and the oldest brother. My oldest is responsible and smart and kind. He is also a bit quiet and sometimes uncertain of himself. Think Luke Skywalker. If I were to compare my younger sons to characters from Star Wars, I honestly might say they are like Han Solo and Chewbacca (or "Chewie"). All bravado and confidence and good times. They are also loyal and loving and funny. The little brothers are becoming more and more like a package deal lately. Wade is the bat boy for JT's baseball team. JT is proud of him and Wade is elated to be included. Everything they do is a competition. "I'll beat you to the front door," one of them always says when they get out of the car. They play hard together and they fight big too. are going to take us on a wild ride. More and more I see that my job as the Master Yoda in all this is to try to teach them to use the force for good. I have to learn to sit back and let them make mistakes. Ahhhhh. I need to give them tools to help them on their journey. Sure I can't teach my boys how to levitate an X-Wing Fighter out of Degobah swamp, but I can teach them some things. I can teach them to be kind and supportive of each other. I can teach them to use their competitiveness in positive ways. It's the little things, it's the big things, it's everything. 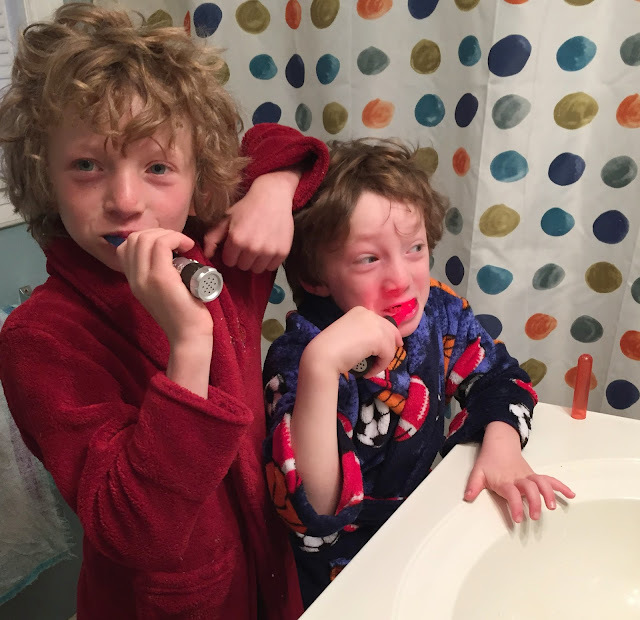 Last week, the little boys got new toothbrushes and even that turned into a competition. There was a little pushing in front of the sink and some harsh words were spoken. 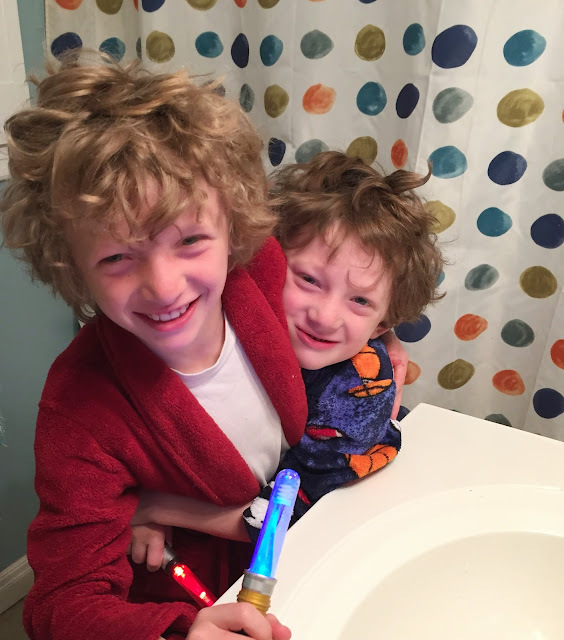 But just like Yoda, I walked into the bathroom and told them in a wise, calm voice to "push the buttons on the toothbrushes and be quiet and wait and to listen." 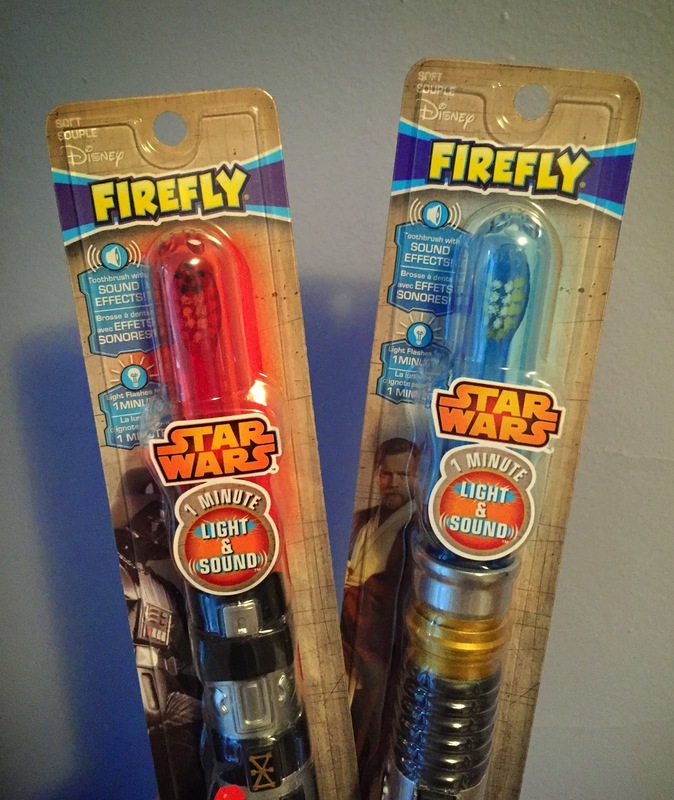 Their new Firefly® Star Wars toothbrushes are shaped like light sabers and when you push the buttons they make sounds like in a light saber battle and say things like "the force is with you." My boys were/are extremely impressed. Wade, who is in preschool, especially loved his new toothbrush and has even made a chart to keep track of how often he brushes his teeth. No more bribing my kids to get them to brush. The toothbrushes are extremely affordable and ADA-approved. Not only were they impressed, they brushed their teeth without a real battle (with each other or me). 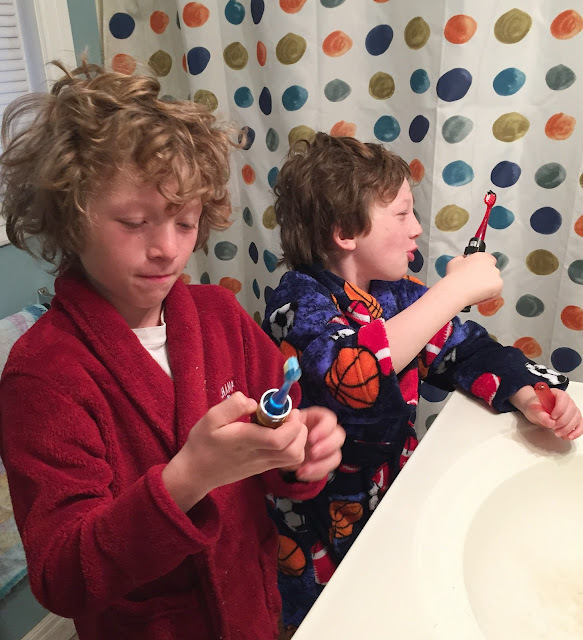 Even the biggest brother thought their new toothbrushes were pretty cool. He looked into the bathroom and gave them an approving Skywalker-like nod. The little boys stood up a little straighter after that and brushed with pride and brotherly love. So like I said, it may not be a lesson in mind control or levitation, but it matters. It's all a part of the bigger picture. It all matters as we teach our little Padawans to take care of themselves and each other and to use the brother phenomenon/force for good. You know what else is good? Winning a trip to California. Yup, it's the #BrushBattle Sweepstakes from the folks at Firefly. Click here http://bit.ly/FireflyBrushBattle for a chance to enter to win a trip for four to an "awesome theme park" in California. Good luck and may the force be with you! Firefly® is a leader in Children's Oral Care solutions and the inventor of the Ready Go Brush. The toothbrushes are really fun and come in other popular characters such as Angry Birds, Hello Kitty, Marvel and more. The toothbrushes have interacting flashing lights and 60-second timers that help teach kids healthy habits that will last a lifetime. I participated in this sponsored campaign on behalf of Firefly® and One2One Network. All opinions stated are my own. Um, lightssabre toothbrushes? I WANT ONE! Those two remind me of Rachel and Claire: best friends and worst enemies, and it changes by the moment. Ha! I love your assessments. And them. And those awesome toothbrushes! All my kids would LOVE these. I may have to get some. p.s. love their matching hair!